Good Booking: Putting this match on the pre-show. This match honestly had no business being on the card at all. It’s almost upsetting that The Miz and the Hardy’s are the very first match of the pre-show. But I digress. This was a throwaway match. Plain and simple. Bad Booking: The Intercontinental title is not on the line. With every title being defended, it’s a shame that the IC title was not on the line. The Miz may have elevated the title on Smackdown! Live, but his reign on RAW has been lackluster. But that’s not his fault. Creative has been botching his booking ever since he won the title. Bad Booking: Jason Jordan takes the loss. So a few weeks ago he’s revealed as the long-lost son of Kurt Angle. Then he gets a lackluster debut. Then he’s put into IC title contention. And now he loses to The Miz. On the pre-show. The Jason Jordan experiment might be dead before it’s ever truly started. Good Booking: Neville regains the title. Neville shouldn’t have lost the title in the first place. I was excited for Tozawa’s win but having Neville drop the title the Monday before Summerslam was a mistake. If Neville had went into the match as champion and Tozawa won that would’ve earned a “questionable” in my book. Tozawa is good but I feel like someone else should be the one to truly dethrone Neville. Good Booking: Allowing Xavier Woods to defend the title. Xavier Woods doesn’t get the credit he deserves for his in-ring work. He’s quick and agile, perhaps even more than Kofi Kingston. And though this is often forgotten due to the irrelevance of The Vaudevillains, he was the first person to kick out of the Whirling Dervish finisher. Allowing Woods to enter the fray gave the match new intrigue against The Usos. Good Booking: The Usos regain the title. This may not be a popular decision since The New Day just won the titles. But it is the right move. The Usos have been on a career renaissance after their character change. They’re vicious and calculating. There’s no doubt that this feud will continue well into the fall. And that’s the right move. There is no other credible tag-teams to challenge The Usos. There was a chance that Corbin walked away with the victory. But it’s hard to imagine him getting the victory after that embarrassing MITB cash-in. It’s even harder to imagine that victory after the reaction he received at Takeover: Brooklyn III. And for that reason, Cena winning here is the right choice. It seems like Corbin’s real-life attitude has legitimately rubbed the WWE universe the wrong way and it wouldn’t be a shock that WWE Brass has noticed this. For the attitude Corbin has, his performances haven’t matched up. He’s lucky Vince has a thing for “big, sweaty men.” This will allow him to continue his feud with Cena. But if he can’t shape up, he’ll be added to the list of superstars that failed the “Cena test”. Good Booking: Natalya finally wins the title. Naomi was booking as champion was not great. Let’s face it. Naomi was a good champion but, Creative was doing her a disservice with her booking. The only person she really beat in her actual title reign was Lana. Three times. She lost her match to Charlotte and Alexa Bliss doesn’t count since she was moved to RAW shortly after losing the rematch. Natalya, on the other hand, has always deserved a run with the title. Whether or not she was saddled with the farting gimmick, referencing songs, or showing picture of cats, Natalya is always business in the ring. This one was long overdue. Good Booking: Big Cass wins I guess? This was an awful feud which I hope ends after this. There really was no other way this match should have ended. Big Show made it clear he was sticking around to put the younger guys over. Hopefully Big Cass moves onto a decent feud. Away from Enzo Amore. Bad Booking: Enzo Amore is useless. There is no questionable booking here. It’s time to realize that Amore, although he is a good athlete, is perhaps one of the bottom rungs on the ladder in terms of in-ring skill. He claimed that he has never dug a hole deep enough that he couldn’t climb out of. Amore escaped the shark cage only to get boot to the face in his underwear. That’s where he stands. He talks the talk. That’s it. Amore should’ve transitioned to a manager role long ago. Bad Booking: Rusev loses the last shred of his credibility. Rusev loses to Cena. Now he loses to Orton. In officially under a minute. It’s safe to say Rusev’s days may be numbered. If there’s someone whose credibility is more shot than Bray Wyatt’s, it’s Rusev. Good Booking: Sasha Banks wins the title. Alexa Bliss has been a good champion since moving to RAW. But that was the right booking. While Alexa Bliss may have improved greatly in the ring, her biggest asset has always been her character work. As an in-ring performer, she relied on intelligence rather than in-ring skill. Sasha Banks has always had her number in this department. The last time they fought, Bliss retained through questionable means. This time around was thankfully different. Good Booking: The Demon prevails. I would like to say that Creative backed themselves into a corner here. But they didn’t. Finn Balor was always going to prevail here. The Demon King returning confirmed that. Balor can lose matches, but Creative should be keen on protecting The Demon King persona. Wyatt winning would have destroyed that aura. And that would have been infinitely worse booking. Questionable Booking: Ambrose and Rollins win the title. I’m still no completely sold on whether or not Ambrose and Rollins reuniting was the right move, but their pairing reinforces the tag-team division with The Revival out of action once again. This earns a “Questionable” due to the fact that they seemingly bypassed over a year of animosity in less than a week to win the titles. The smart move would’ve been to tease tension between the two. But on the other hand, winning the titles allows for more booking options. Sheamus and Cesaro can feud with the new champions, split, or another team can enter the fray. An NXT call-up might be in the books as well. Good/Bad Booking: Tension between McMahon and Owens costs Owens the match. There is no questionable booking here. The tension between McMahon and Owens was perfect for this match. With McMahon clearly trying to pay neutral, Owens’ temper and distrust cost him the match after his shoving match with McMahon. This was the “Good” booking. So why the “Bad” booking as well? Shane McMahon is known as a wildcard as an in-ring competitor. I bring up McMahon as an in-ring competitor because that’s clearly where this is heading. But the issue stands as what credibility does beating Shane McMahon give you? In reality, beating Shane McMahon shouldn’t have as much pull as it does. But in the end, this is going to be considered a high profile feud. Bad Booking: Nakamura loses by pinfall. Mahal retaining the title is fine. The manner in which it happened is not. Nakamura should have been protected here with a win by disqualification. The match itself was a letdown. As much as Nakamura is a ring general, he can only do so much to try and put on a great match. That’s not necessarily a shot at Mahal, but every single Jinder Mahal title defense that’s not against Baron Corbin has ended with him needing a distraction. With this finish, this feud will continue, but Creative must be careful with Nakamura in the future. Good Booking: Everyone gets their chance to shine. Titans collided. Every single person was allowed to shine with Reigns spearing Lesnar through the barricade, Strowman decimating everyone, Lesnar’s badass return, all the way down to Samoa Joe carrying the bulk of the actual wrestling. Even with Joe not receiving a crazy spot, he was never out of contention as he could just as easily slipped in at the opportune moment and put someone to sleep. All-in-all, the way this match was booked allowed every single person to believably leave Summerslam as champion. 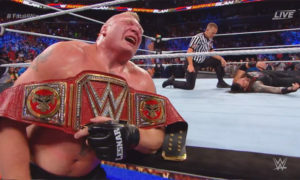 Good Booking: Lesnar retains by the skin of his teeth. 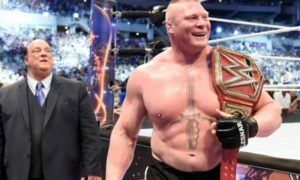 There was an aura of belief that if Brock Lesnar lost, he was truly going to leave. But that’s not the point here. Lesnar vulnerable against Samoa Joe. But here, he looked human. He wasn’t a beast. He wasn’t a conqueror. He was a man on the brink of defeat who threw a blind, wild haymaker and hit his mark. 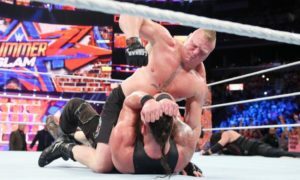 Lesnar’s increasing vulnerability means that he will be beaten. And he will be beaten soon. And that is a big deal seeing that he was never pinned or submitted when he lost the WWE World Heavyweight title.